Clyde Yancy, MD, MSc, vice dean for Diversity and Inclusion, chief of Cardiology in the Department of Medicine, Magerstadt Professor and professor of Medical Social Sciences was a co-author on a study published in Circulation. Overall hospital volume is a poor measure of the quality of medical care received by Medicare patients with heart failure; instead, paying attention to specific process-of-care measures may be more useful for future investigations, according to a Northwestern Medicine study published in Circulation. 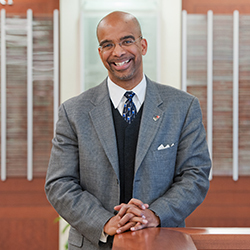 The multi-center study was co-authored by Clyde Yancy, MD, MSc, vice dean for Diversity and Inclusion and chief of Cardiology in the Department of Medicine, and recommended hospital profiling for heart failure care should focus on risk-standardized outcomes and adherence-to-process metrics. Heart failure is one of Medicare’s most common and expensive medical conditions: 83 percent of patients are hospitalized at least once and 43 percent return to the hospital at least four more times. This large burden highlights the need for an easily obtained quality measure that could identify hospitals or organizations as models to imitate, or as targets for improvement initiatives. One possible measurement is the use of hospital volume as a surrogate metric for assessing quality of care, a practice that has gained traction in the past few years. The accuracy of volume as a stand-in for individual cardiovascular conditions, including heart failure, however, has not been well explored by previous studies. In the current study, investigators sought to determine the viability of using hospital volume as a surrogate measure, analyzing Medicare data from the American Heart Association’s Get With The Guidelines (GWTG) heart failure registry, a hospital network voluntarily reporting patient-level data on heart failure treatment. A total of 125,595 patients at 342 hospitals were included in the analysis, and hospital volume was measured against adherence-to-process measures at discharge, 30-day mortality and six-month mortality and readmission. According to the study’s findings, while hospital volume correlated with adherence-to-process measures at discharge, there was no correlation with 30-day patient outcomes and only a marginal correlation with six-month outcomes and rates of patient readmission. According to the study, the correlation between volume and process measures was expected: Experience and repetition instill habits into clinicians, and higher volume hospitals are more likely to be located in urban settings or function as teaching hospitals with the resources to utilize the latest devices and techniques. The authors recommend that instead of purely relying on volumes, measures of heart failure care quality should drill down the systems of care. Quantifying why some hospitals deliver better care could produce better results in improving quality and reducing costs for all hospitals. “To do this, the focus should not be on large-volume hospitals but rather on evidence-based quality measures,” said Yancy, also Magerstadt Professor and a professor of Medicine in the Division of Cardiology and of Medical Social Sciences. Yancy also serves as Chair of the American Heart Association GWTG heart failure registry, a quality improvement initiative that holds more than 1 million patient records and captures data from over 35 percent of all U.S. hospitals. The GWTG-Heart Failure program is provided by the American Heart Association; is sponsored, in part, by Amgen Cardiovascular; and has been funded previously through support from Medtronic, GlaxoSmithKline, Ortho-McNeil, and the AHA Pharmaceutical Roundtable. In addition, Yancy recently co-authored a separate study, published in the Journal of Clinical Investigation, that examined a common genetic variant that can contribute to heart failure mortality.